Mandarmani is a wonderful weekend getaway from Kolkata. A quiet, laid-back village, Mandarmani offers a near virgin beach. It's less than 200 km from Kolkata - the roads are excellent and it's a wonderful drive. 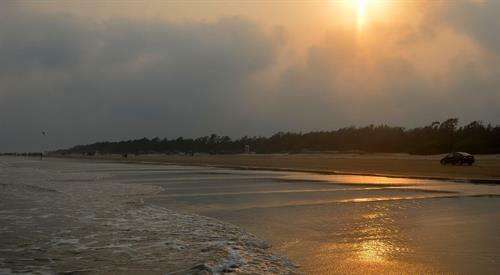 Go to Mandarmani for a relaxing and enjoyable short-break. We had made Kolkata the city of joy our home, albeit temporarily, as we were on deputation to the city for around 10 months. It was August of 2014 and with no rains in sight, the city was a virtual furnace. So, though we had adjusted to city and the new way of life there, we needed a break from the sweltering heat on offer. My family and I did the best we could – we locked up our palatial colonial bungalow and headed for a smooth 2 and a half hour drive (180km) to Mandarmani, via the Kona Expressway and the Mumbai Road. I hadn't heard of this place until we got to Kolkata. And everyone we knew recommended Mandarmani for a short, rejuvenating holiday. We were told for seclusion and calm seas, there is nothing like Mandarmani among the new resorts on the Bay of Bengal coast. And we found this to be true. It offered the much needed respite from the bustling city life. Go there, if you want to hear the sea and only the sea, so that you even begin to imagine it out there in the pitch darkness just beyond your sight. We had been to beaches before and knew beach sands to be grainy and difficult to walk on, so were quite intrigued when told that the beach is perhaps the longest drivable beach in India (15km). Longest or not, we found out only during our trip that it's drivable only up to a point, and before the evening high tide leaves the sand soft and dangerously seductive towards car tyres. For now though, the beach is the only way to get to some of the hotels on the sand (as ours was), so it's best to get there before dark. It looks like time has stood still in this place. Mandarmani remains a small sleepy fishing settlement; with civilization creeping in, slowly. There are a row of hotels on the beach front and a few before you reach the place, just beyond the tiny village of Dadanpatrabar. 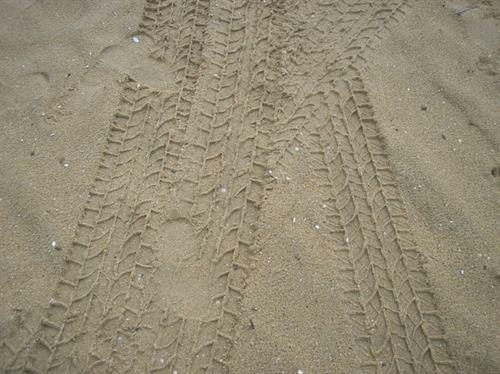 The road the car took crumbled into soil as we neared the beach. In places red earth was rolled into a levee over a spreading stream for the cars to pass. There were a few stores, more like shacks selling biscuits, chips etc. Since Mandarmani draws weekend vacationers from Kolkata, many shacks had their shutters down, waiting perhaps for the weekend rush. Acres of fallow land spread out as far as the eyes could see. We were in the midst of wilderness, this we realized as the sun went down. There was hardly any electricity after dark, except in the larger resorts; and they too had generators running. We stayed at the Digante Resort; which is one of the better resorts in the area. The staff here was warm and friendly, even though we didn't speak the local language. The restaurant at our hotel served all meals, offered room service too, but the food was expensive. The rooms were fairly clean. I was actually surprised to walk into a room that didn't smell stale and musty. The linen was fresh and the bathroom clean; just the way I like it. I recommend the place. Other hotels had their own private beaches and outdoor entertainment areas. Ours had a jhau(Casuarina) forest with hammocks strung between the trunks. There wasn't much we could see of the beach after sundown, since it was remoteness we wanted and remoteness we got. The only lights on the beach were that of the next hotel about a fifteen minute walk away, through sand and a strong sea breeze. At dawn of course there was the splendid sunrise to watch, and there wasn't anyone else on the beach as far as we could see. We had the beach to ourselves. There aren't any "activities" on the beach as such beyond swimming, so you can bring your own! 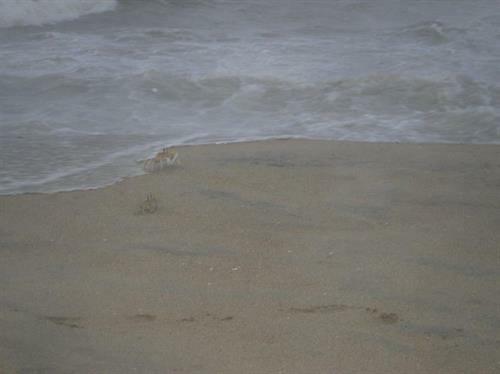 We frolicked in the Bay of Bengal for a bit; and watched crabs scampering on the sands. For the most bit we just let time fly by, without a care or worry. Well, that's the kind of tranquilizing effect the place has on you. 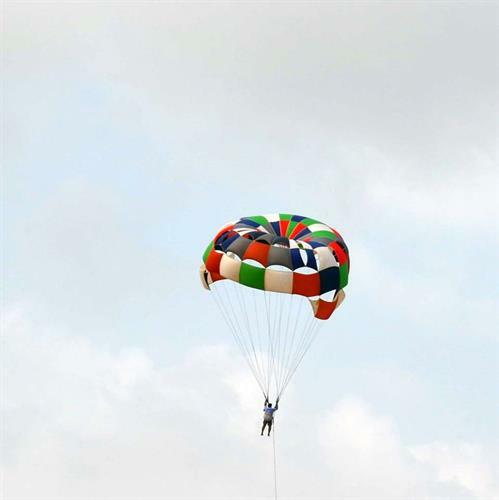 But around mid-morning, a jet-ski pilot got his ski in the water with an eager passenger, and some parachutes appeared offering para-sailing runs on the long, smooth stretch of beach. Just a short walk from the hotel, we found a little shack selling tea and snacks. There were a few such stalls at irregular intervals on the shore. It was a quaint little shack with the roof made of bamboo and the dried jhau leaves that thrive in dense clumps beyond the beach. These shacks are a boon for holiday makers who want to go beyond the standard (and expensive) hotel food and, more importantly, try the fresh catch – fish, crabs and king prawns cooked spicy and Bengali style. We were asked to order our seafood lunch around breakfast. 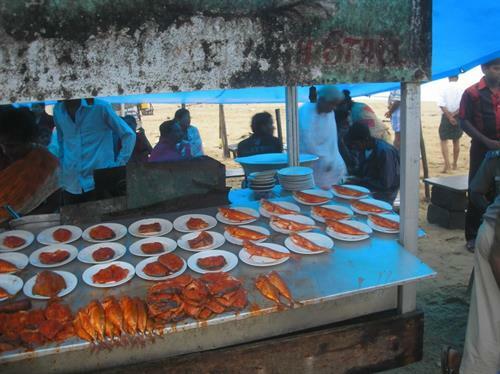 The stall keeper's son rode his bicycle to Contai, the nearest railway station, 8 kilometres away to get the seafood. This was ironic, since we were right on the sea. We found out later that fishing is not a major industry in Mandarmoni. Tourism is still in its infancy. The locals scrounge around for work and wait eagerly for weekends. Generators power the hotels that do have power. This is, in a way, both a blessing and a curse. The price of seclusion, which isn't really much for two days if you're a tourist, but for the local's life, must be hard. In the evening, we took a ride (on the back of an improvised motorbike-run cart) to the delta or mohana at the end of the beach, where the local river meets the sea. The sun was setting and the fishing boats were outlined in the haze. On the other side of the river, like at a three-way crossing, we could see the opposite river banks faintly while the sea stretched away endlessly. This was the image that I think my family and I brought back from Mandarmani, the sense of a place at a crossroads, and at land's end. My friends visited Mandarmani last year and they have a lot of good experience to share. I'm planning to visit this place next month with my in-laws. Is this a good place to visit in summer? Also, are there good hotels? Can you suggest some hotels with affordable price? I'm not keen on any luxury at all and all we need is some good hotels to sleep. Not even free breakfast is required. Beaches are always hot and humid in summer. But in Mandarmani, as life is slow with a lot of greenery in the resorts, you don't feel that bad in comparison to that of the crowded cities. 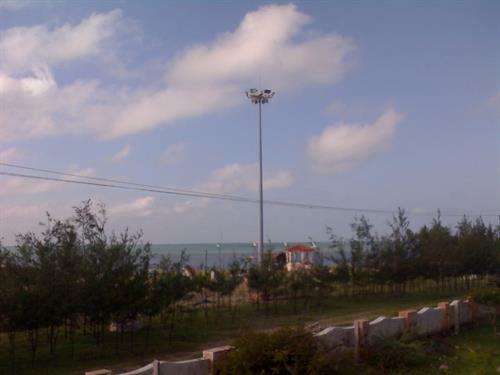 I know one resort that is "Samudra Saikat" which has an excellent campus along with its own beach. We went quite a few years before, and at that time it was quite reasonable with good food and facilities. I don't know whether they have included AC Rooms now, but their campus itself is cool and refreshing with a swimming pool inside and have a very good maintenance staff who respond in time. They also have an option to pick you up from the Kontai station. @Arunesh, there are a number of places to stay in Mandarmani, and you'll definitely find an easy on the pocket resort. I was there only for the weekend and do not have much details on prices of resorts to share. However, we stayed at Digante Resort which was not very expensive. Mandarmani is being developed as an alternative to Digha. It is located at East Midnapore District. The beach is 18 km. long and motorable. The best time to visit is winter (October to February). There are some hotels at Mandarmani but the tourists should visit this place from Digha. Regular bus service is available from various parts of Kolkata. The tourists should get down at Chawlkhola bus stop and go to Mandarmani by local transport. Train is available from Howrah to Digha. 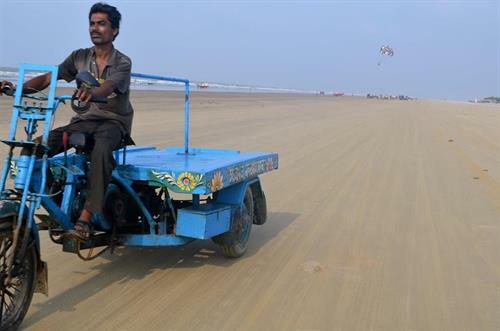 Tourists may visit Mandarmani from Digha by arranging local transport. As mentioned by Ms.Juana, tourists from Kolkata visit this place during weekend. The tourists are advised to make a trip to Mukutmanipur-Digha-Shankarpur-Digha-Bishnupur for two days to cover four tourist spots of this part of West Bengal. Mandarmani is really a beautiful place. What I don't like there is the business attitude of everyone you see there. It is no different in other tourist places in India. Whever you go, you will see a bunch of sellers and agents coming after you offering you a lot of services. It is hard to tell who are genuine and who are not. Anyway, Mandarmani is an amazing tourist destination. There is nothing much in Calcutta for tourists and secluded beaches like this are something we, Kolkatans really wants to know and visit. The street food and Hilsa are something that I enjoy much in Calcutta. Anyone who knows whether any other tourist spots near Mandarmani? Kolkata is a bland town without much entertaining and trip destinations. Only relief is it's varieties of eateries and choices that makes us crave more. This beach and fishing village at Mandarmani is very new to me. I will be checking out this destination soon. Also, is there any gmaps or route information from Kolkata available?